"Your baby just elbowed me!" I complained. Repeat the above conversation about 50 times and you'll get a general idea of my day. Bad news, all that elbowing, kneeing, nudging, pushing and kicking every 15 minutes led to a tummy that looks like it's about to explode (and feels like it too) even though he is only a healthy 2kg (both my babies never liked the claustrophobic space in my womb). Oh my, what big fists you have! All the better to punch you with! The good news? Well, I've never had to track the minimum 10 fetal movements a day (as anything less is an indication of possible fetal trouble) as my babies definitely way exceed the minimum. 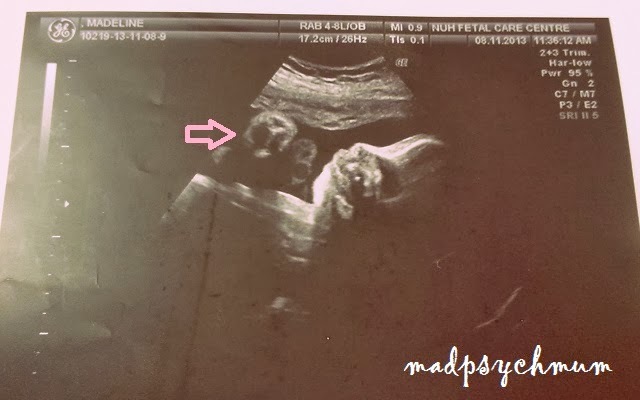 In addition, none my ultrasounds took more than 30 minutes nor have I needed to walk around and go back for a second scan because all that movement allowed the sonographer to capture every body part she needed within minutes. In fact, my sonographer had trouble keeping up with my baby! "And here's the kidn.. no wait (moves the ultrasound scanner) ok here's the kidney.."
I suppose I better enjoy it while it lasts.. 'cos I know one day, I will miss this circus in my tummy.